All across the country, butterflies are becoming as popular as birds and wildflowers, especially among people seeking to enjoy the rich natural resources that Texas possesses. John and Gloria Tveten have been studying butterflies in Southeast Texas for thirty-five years, and here they offer their considerable knowledge to everyone who shares their passion for butterflies. In this easy-to-use field guide, the Tvetens describe and illustrate more than 100 species of butterflies that live in Southeast Texas and can often be found across the state. Striking color photographs of living butterflies and caterpillars (a unique addition) show the key marks and characteristics necessary for field identification. The Tvetens' enjoyable and authoritative text describes each species' life history, habits, flight patterns, and characteristic markings. An account of the different butterfly families, from swallowtails to longwings to skippers, precedes the descriptions of the species within each family. 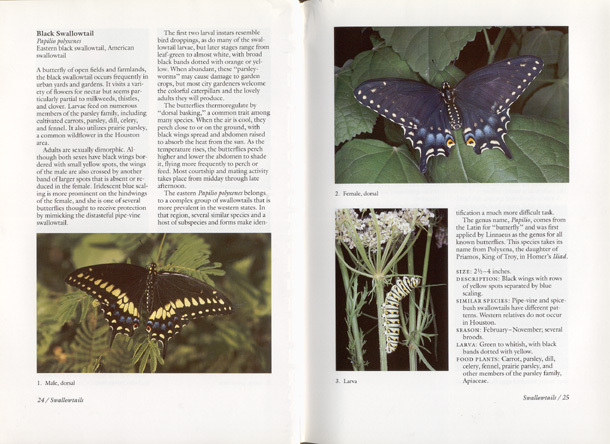 The Tvetens also include an interesting discussion of butterfly biology, a complete checklist of area butterflies, an index of butterfly-attracting plants, and pointers to other butterfly resources. This field guide is the first to focus exclusively on Southeast Texas butterflies. It will be the essential reference for everyone seeking a reliable way to identify these butterflies, from field observers to apartment dwellers who wonder what is fluttering around the pot plants on the balcony. John and Gloria Tveten have written the weekly "Nature Trails" column in the Houston Chronicle for over twenty-five years. They are the authors of several books and many magazine articles on Texas birds, wildflowers, and natural history. The study of butterflies has long been the province of the professional or serious amateur collector. The insects are captured and carefully mounted, their wings spread for display. Identification then becomes a matter of systematic comparison with photographic or painted illustrations depicting all the species of a given region. Specialists even dissect the bodies of certain species to verify by microscopic examination their identities, allowing, at the same time, a careful study of taxonomic relationships. 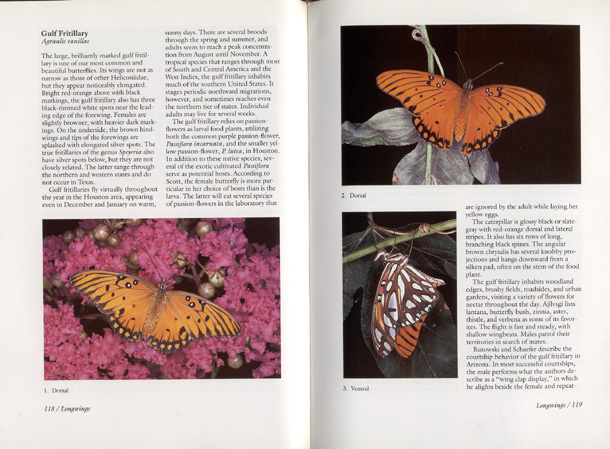 There are numerous manuals and field guides available for the serious butterfly collector. Some depict representative butterflies from around the world; others treat the species of North America, the eastern or western states, or even a specific state or region. Many of these sources are listed in the bibliography. Recently, however, there has been a dramatic turn toward butterfly watching as a rewarding outdoor pastime, much like the way the popularity of bird watching is sweeping the country. The butterflies are observed in their natural habitats, appreciated for their gemlike beauty and lilting flight, and then allowed to continue on their way. Hikers and campers, gardeners, birders and wildflower enthusiasts, nature photographers--all are discovering that butterflies can add enjoyment to their pursuits. Most people will want to identify the species they see, to put a name on their new discoveries and learn more about the habits of these fascinating insects. That is the purpose of this book. Identification, of course, can be difficult in the field. Some butterflies do not allow a close approach, or they might fly before distinctive features can be seen. Some diagnostic field marks are visible only at close range or when the wings are widely spread, as with mounted specimens. Many butterflies sit with wings tightly closed, failing to reveal the upperwing patterns usually portrayed in field guides intended for collectors. Here, however, we show live butterflies in their natural positions, sometimes with wings spread widely, often with them closed above their backs. In many cases, the underwing pattern is most diagnostic, particularly within the confusing array of small blues, hairstreaks, and skippers. Not every butterfly can be identified conclusively in the field, but with patience the careful observer can soon learn the species of the area. We have designed this book specifically for Houston, Texas. All of the common butterfly species are described and illustrated, as well as most of those that occur less frequently. It is not possible to include every individual that might stray into the region on rare occasions, for vagrant or wind-blown butterflies sometimes turn up far from their normal range. Texas has repeatedly been termed a "biological crossroads," and we see influences from all directions, including tropical butterflies that range across the Rio Grande from Mexico and sometimes wander farther north. 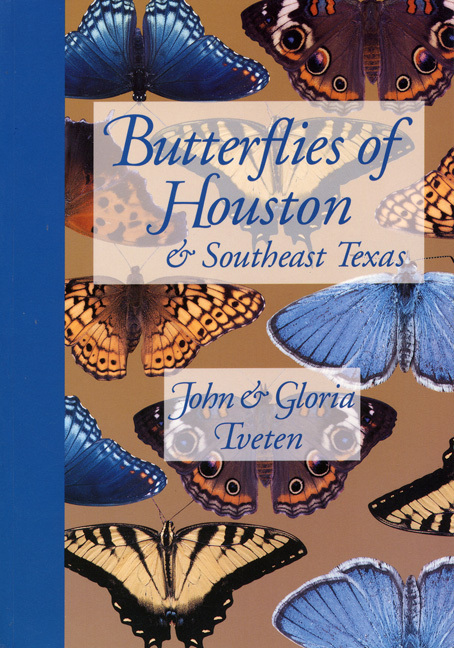 Most of the butterflies seen in Houston and the surrounding Southeast Texas area, however, will be found on the pages of this book. We have an advantage in treating a limited area. Many of the problems in butterfly identification stem from the large number of similar species that occur in varied habitats across the country. Scores of confusing crescents and checkerspots, hairstreaks, or skippers confront the beginning butterfly enthusiast from the pages of the standard field guides. In most cases, only a few inhabit any given region, and the choices in a local book are limited and less intimidating. We have no quarrel with butterfly collecting. Indeed, our interest was first kindled through that hobby. Many problems of classification and taxonomy can be solved only by collecting, and much remains to be learned from the collections of museums and qualified individuals. Such activities have no effect on butterfly populations when pursued in moderation, for most species lay their eggs almost immediately after emerging and seldom live for more than a few days or weeks. Only when rare species are confined to limited habitats is there a need for restrictions on insect collecting. Most people, however, prefer to enjoy and learn about butterflies as part of the natural scene. It is to them that this book is directed, hoping it will stimulate interest in the beautiful and fascinating creatures with which we share our world. Perhaps the most frequent question asked about butterflies is: "How do they differ from moths?" There is no straightforward, all-inclusive answer. In general, butterflies are active almost exclusively by day; moths tend to be nocturnal. The antennae of butterflies end in pronounced clubs or swellings, while those of moths have no clubs and are usually feathered or threadlike. Butterflies lack the frenulum, a coupling device that hooks together the forewing and hindwing of most moths. There are, however, small groups that do not fit these nice categories. Butterflies and moths combine to form the scientific order Lepidoptera, a word coined from the Greek lepis, "scale," and ptera, "wing." Their thin parchment wings are covered with tiny overlapping scales both above and below, making possible different colors and patterns on opposite sides of each wing. Butterflies, in turn, comprise two superfamilies: Papilionoidea, the "true butterflies," and Hesperioidea, the skippers. The latter tend to be robust, heavy-bodied insects with distinct hooks at the tips of their clubbed antennae. Most are small and drab, and they fly with the quick, darting movements from which they take their name. Both superfamilies are included in this book. Estimates vary as to the number of butterflies found throughout the world. Most authors cite between fifteen thousand and twenty thousand species, although classification changes constantly. Much remains to be learned about the relationships of various populations. Some valid species look much alike, while other species have geographical or seasonal forms that are very different in appearance. About seven hundred butterfly species are found at least occasionally in the United States and Canada. Many are common residents across large portions of the continent; others appear as rare strays from Mexico or the West Indies. Roughly one hundred species occur regularly in Houston and the neighboring areas of Southeast Texas. Some are eastern forest species and reach the southwestern corner of their range in the wooded portions of northern Harris County. Others wander eastward from the more arid Hill Country or northward along the coast in summer from deep South Texas and the Rio Grande Valley. Because butterflies are tied to specific larval food plants, they have definite preferences in habitat. Some wander widely as adults, perhaps to feed at nectar plants in backyard flower gardens. Others rarely leave their own special niches. Pine woodlands, salt marshes, and prairie grasslands all have their own unique butterflies. Finding them involves learning their individual requirements. Most professional biologists and serious students of plants and animals use the scientific names, a system devised by eighteenth-century Swedish botanist Carl von Linné, or Carolus Linnaeus. In Linnaeus' system, every species has a two-part Latin name. Current usage places that name in italic for publication. The first part is always capitalized and indicates the genus, a group of very closely related organisms. The second part is not capitalized and describes the individual species. There can be only one pair of names for any life-form, and no two plants or animals share the same scientific name. Unfortunately, no such list is inviolable, and even the scientific names change from time to time. Some changes occur as we learn more about butterfly populations and their relationships; others, as the result of scientific precedent. Thus, not all authors agree on the proper nomenclature. 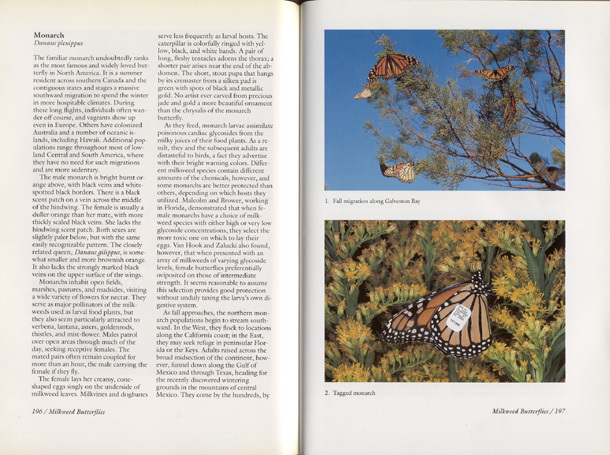 In general, we have followed the Lepidopterists' Society's A Catalogue/Checklist of the Butterflies of America North of Mexico , by Lee Miller and F. Martin Brown, published in 1981, and its supplement, edited by Clifford Ferris in 1989. In a few cases, we have adopted recent changes to that system. Common names for butterflies present an even greater problem, for there has been no standard system. One reference, for example, may call a common Houston species the "ocola skipper," while another gives it the name "longwinged skipper." In an attempt to standardize such nomenclature, Jacqueline Miller published The Common Names of North American Butterflies in 1992, using a general consensus from current field guides and butterfly manuals. She also listed other commonly used names. Also in 1992, the English Names Committee of the recently formed North American Butterfly Association (NABA) adopted a slate of common names, seeking to standardize the system even more and to use names that impart additional information about close relationships and important features. In order to be consistent with the nomenclature in most of the field guides now in use, we have, in general, followed Miller's system. When the NABA choice seems to have particular merit, however, we have adopted it instead. All such common names are listed under each species account, and all are included in the index. Most animals change significantly during their lifetimes, but few do so as dramatically as the lepidoptera. In a complete metamorphosis, butterflies pass through four major stages--egg, larva, pupa, and adult--undergoing amazing transformations at each step. Psyches develop from caterpillars which grow on green leaves... ; first they are less than grains of millet, then they grow into small grubs and in a few days into little caterpillars; after this they grow more and become quiescent and change their shape and are called chrysalides and have a hard shell; but they move if they are touched. They are attached by spider-silky filaments; they have no mouth or any other obvious organs; after no long passage of time the shell bursts open and out fly the winged creatures which we call psyches. The metamorphosis occurs with amazing rapidity, a complete life cycle often taking no more than a month. A butterfly egg usually hatches in about five days, and the caterpillar progresses through several molts in two or three weeks before pupating. Eight to ten days later, a perfect adult butterfly emerges from the pupa, ready to repeat the cycle. During the warm spring and summer months, many of our species go through several such cycles, raising two or more successive generations of butterflies in a single season. Most, however, have a resting stage during part of the year, usually because of cold winter temperatures. Triggered by changes in the length of the daylight period, eggs or pupae enter a stage of arrested development called diapause, resuming their development again in the spring, when emerging caterpillars or adults can find an adequate food source. Adults or partially grown larvae may also hibernate during periods of cold weather, emerging occasionally from their shelters on warm winter days to feed. Female butterflies lay their eggs either singly or in groups, usually on the leaves or new growth of appropriate larval food plants. While adult butterflies sip nectar from a wide variety of flowers, the caterpillars have a much more limited diet. Many are confined to a single plant genus or family. The female butterfly detects the proper host visually and then lands to sample it with sensory cells on her legs or antennae. She will lay dozens, perhaps hundreds, of eggs during her short life. Butterfly eggs take a variety of shapes, sizes, textures, and colors. Some are spherical; others are conelike or spindle-shaped, often with minute ridges or sculptured ornamentation. If they begin to develop immediately, they normally hatch within a week. A young caterpillar's first meal often consists of the remainder of its eggshell; it then proceeds to feed on tender plant material. Young leaves and flower buds provide nutritious fare. If several eggs were laid together, the larvae feed communally through their early stages, usually skeletonizing the leaves until they can eat the tougher veins. Later, most wander off alone to complete their development and find a site in which to pupate. The caterpillar body consists of the head, three thoracic segments, and ten abdominal segments. The thorax carries three pairs of true legs typical of all insects. They will also be found on the adult. Four pairs of prolegs on abdominal segments provide the major means of larval locomotion, but they will not be preserved in the adult butterfly. The larva breathes through small holes, or spiracles, on the sides of the thorax and abdomen; the head is equipped with minute eyes, a silk spinneret, and powerful chewing mandibles. A varied array of setae, or short "hairs," stiff spines, and fleshy filaments adorn many caterpillars. Because an insect's tough chitinous skin does not grow or stretch, the larva must shed its skin several times as it grows. It usually goes through five different stages, called instars, from hatching until pupation. The old skin loosens and splits open, and the caterpillar crawls out with a new skin and head capsule. The color and ornamentation may change with each new instar. Few caterpillars feed in the open, fully exposed to predators and parasitic insects. Many seek shelter by folding leaves or gathering and tying them together with silk, while others hide by day under bark or at the base of plants and emerge at night to feed. Camouflage patterns and branching spines offer a degree of protection, and a few species consume toxic chemicals in their food plants and advertise their distastefulness with bright warning colors. The larval stage of a butterfly can prove as interesting as the adult itself. It is often the longest lived of the stages, and it is the one in which all of the growing occurs. Once a butterfly emerges from its pupa and expands its wings, it will grow no more. On reaching maturity, the final-instar larva stops eating and selects a suitable pupation site, sometimes wandering far from its food plants. During its last day as a caterpillar, it may also change color and expel fluid to become shorter and plumper. Some species choose to pupate on the ground amid the leaf litter; others remain in their leafy nests. Many larvae hang head downward from silken pads or rest suspended in girdles of silk. Once the caterpillar is securely in place, the skin splits and rolls down, revealing the fresh chrysalis beneath. In one quick movement as the skin is discarded, a hook, called the cremaster, at the tip of the abdomen is anchored securely in the silk pad. Over the next few hours the pupa will harden and change shape slightly, assuming a characteristic appearance that serves to identify the butterfly developing within. Because the inert chrysalis provides a tasty morsel for birds and other predators, it is usually camouflaged in brown or green, blending with the leaves or twigs on which it rests. If disturbed, it may twitch violently from side to side. Development of the butterfly can sometimes be observed through the translucent pupal shell, the wing pattern becoming gradually apparent. On the day of eclosion, the adult forces its way quickly out of the pupal case and hangs on the empty shell to expand its folded wings, slowly pumping body fluid through the soft veins. Once expanded, the butterfly rests for an hour or more before the fragile wings harden enough to support flight. During the expansion and hardening process, the wings can be easily damaged. An adult butterfly does not grow; once it expands after emerging, it remains the same size throughout its short lifetime. Life expectancies of butterflies vary dramatically. Some adults live only a few days; a week or two is typical for many species. Autumn generations of some butterflies, however, live for several months, hibernating through the winter to mate and lay their eggs the following spring. The famous monarch, of course, migrates southward for the winter and retraces at least part of its route in spring before producing another brood. The adult has only a sucking proboscis rather than chewing mouthparts. As a result, butterflies cannot consume solid food. Many obtain energy by sipping sugar-rich nectar from flowers. Others drink fluids from tree sap, rotting fruit, bird droppings, animal dung, or carrion. Some species, particularly the males, gather at mud puddles or damp sand to imbibe water rich in dissolved salts and other nutrients. Hill's laboratory experiments clearly show that the availability of carbohydrates increases longevity in several butterfly species. Given only water to drink, small lycaenids lived only three or four days; with 10-percent honey solution, they survived for fifteen to twenty days. The lives of butterflies revolve around warm sunlight, nectar, and actively growing plants on which the females can lay their eggs. The timing of the various broods has evolved to take advantage of all three conditions. Because butterflies are cold-blooded, they must warm their bodies and powerful flight muscles to a certain level before they can fly. This is accomplished by basking in the sun. Some species spread their wings widely to the warming rays; others hold them closed above the body but turn until they are perpendicular to the sun. The latter are usually darkly colored below, a factor that aids in energy absorption. In cool weather or on cloudy days, butterflies may not fly at all. They roost at night, usually with wings tightly closed, in some sheltered niche or beneath an overhanging leaf. Most perch alone, but a few species congregate at nightfall in large communal roosts. Butterflies face constant danger throughout all four stages of their development. Weather, of course, plays an enormous role in their lives. Many species cannot survive extreme cold, and early freezes catch some broods unprepared. Migrants that wander northward may not survive the winter and must recolonize the region every year. Heavy rains and strong winds take their toll by damaging fragile wings; washing eggs, larvae, or pupae from their precarious perches; or destroying larval and adult food resources. Birds, mice, lizards, spiders, and other predators hunt adult butterflies as well as caterpillars and chrysalides. Predation on lepidoptera by other insects is a major factor. Praying mantids, dragonflies, wasps, stinkbugs, and a variety of six-legged carnivores do not draw the line at feeding on others in their class. At times it seems as if much of the natural world runs on caterpillar power. Viruses and fungal diseases often wipe out entire colonies of lepidoptera larvae, spreading rapidly when the caterpillars become too numerous and crowded. Parasites play the largest regulatory role. Some tiny insects lay their own eggs within the shells of butterfly eggs, their larvae emerging in place of the intended caterpillars. Tachinid flies and ichneumonid, braconid, and chalcid wasps lay their eggs on or within the bodies of caterpillars. The larval flies and wasps live and feed within their still ambulatory prey, which do not die until the parasites have matured, thereby assuring a fresh and ample food supply. The power of flight, of course, enables adult butterflies to escape many threats, but they are subject to constant danger from equally agile birds. Other predators lie in wait wherever butterflies choose to feed or roost. At all stages in their life histories, butterflies depend on a variety of protective mechanisms. Some larvae are protected by an armament of spines or by distasteful body fluids containing toxic chemicals sequestered from the plants they eat. Others are adept at building shelters, and many carry camouflage to the extreme. It is a delicate balance, this constant struggle against enormous odds, but butterflies manage to endure as long as they can find their allimportant food plants and selected habitats. This rapidly growing hobby requires no equipment beyond a book for identification and, perhaps, binoculars with close-focusing capabilities. Such binoculars bring the butterfly into closer and sharper view while the watcher remains at a distance. Glassberg, in his excellent book for the northeastern region, Butterflies through Binoculars , recommends Minolta "Pocket" binoculars that focus down to a distance of six feet or less. Some butterfly watchers, Glassberg notes, prefer 7X or 8X models; his personal choice is 10X, enlarging the image ten times. Many of the models used by bird watchers do not focus closely enough, making them of limited utility for the smaller butterflies. Any binoculars, no matter how inexpensive, will be of some assistance; the most important objective is to enjoy the adventure of the hobby. Butterflies occur virtually everywhere, offering added interest to family outings and vacations. A remarkable number live or feed in backyard flower gardens, and several of these are on the wing on warm, sunny days almost throughout the year in Houston. Because each species has special habitat requirements and peak flight times, each outing may provide something new. Even the novice butterfly watcher can contribute to scientific studies by careful observation. The life histories and larval food plants of many species remain unknown, while few regions have complete checklists of local species. By keeping dated records of butterflies and their numbers, along with individual habits and plant preferences, one can assemble much new and useful data. Collecting has played a major role in accumulating the knowledge of butterflies we now have. It is the only way to study in careful detail their structure and variation and to compare individuals and populations. As noted earlier, collecting has little impact on butterfly abundance, for most mate and lay eggs shortly after emerging and then die within a few days. Collecting rare or threatened species, or catching large numbers from a single population, obviously should be avoided. Butterfly collecting, however, requires considerable effort, not only in properly mounting each specimen, but in maintaining the collection and protecting it from dermestid beetles and other museum pests that make inroads into collectors' treasures. Every specimen collected must be properly labeled; without data it is scientifically useless. Each label should contain the state, county, locality, date, and collector's name. Other useful information includes the elevation, weather conditions, plant associations, and so forth. Butterflies may be collected with nets or raised from larvae. Lepidopterists also attract moths to bait traps and to lights at night. There are many books to aid the beginning collector, some of which are listed in the bibliography. 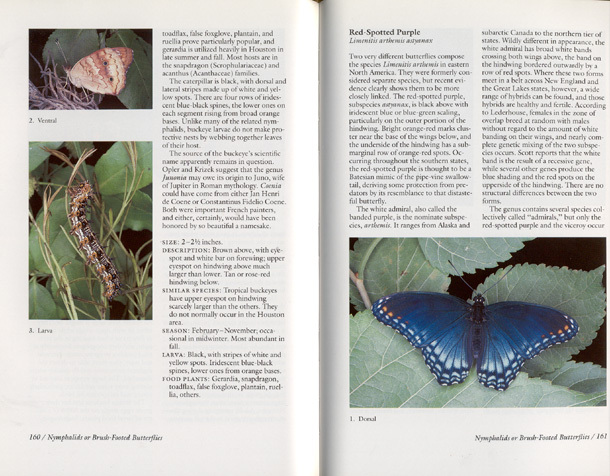 Detailed equipment and techniques are beyond the scope of this book, however, and we encourage the reader to enjoy butterflies as living creatures and to observe their role in nature. Caterpillars of many butterfly species are relatively easy to find. Gulf fritillary larvae, for example, feed on passion-vines throughout the Houston area, while tawny emperor larvae browse on the leaves of hackberry trees. In almost every habitat, from backyard gardens to dense woodlands, at least a few caterpillars will be eating away at the grasses, wildflowers, shrubs, and trees. The larval food plants of each butterfly are listed in the species accounts. It is possible to observe caterpillars in their original locations, but many will be lost to parasites and predators. Others will wander off to pupate unseen, and it is difficult to follow a larva through its final stages. For this reason, many people enjoy raising butterflies in captivity, releasing them after they emerge. It is, of course, the best way to obtain perfect specimens for a collection or for close-up photography. Caterpillars can be placed singly or in small numbers in a variety of containers. Plastic boxes or wide-mouth jars work well and allow close observation. Screen cages or jars with netting over the top also prove useful, but larval food plants should then be kept in small vials of water to prevent them from drying out. Each container must be cleaned at least once a day and fresh leaves provided; plant cuttings can usually be kept in a plastic bag in the refrigerator if there is no live plant nearby. As the caterpillars mature, twigs can be added as pupation sites. Rearing butterflies requires time and effort, but it can be a rewarding experience. Many larval hosts remain to be discovered, and the behavior of various caterpillars can be amazingly complex. This also provides a dramatic, hands-on way of introducing children to the world of nature. : As noted above, rearing butterflies from their larvae provides fresh and undamaged specimens for photography. Newly emerged adults do not fly immediately after unfurling their wings, and they can then be transferred carefully to a suitable and photogenic outdoor location or to an indoor setup. The entire life cycle can be documented on film, providing an excellent photo essay. A single lens reflex camera is almost essential for good close-up photography. Indoor work with insects of any kind requires flash equipment, while outdoor work usually requires longer lenses. In order to obtain large enough images, most butterfly photographers rely on macro lenses of various lengths. Most of our butterflies were photographed with either 50mm or 100mm macro lenses. To obtain the depth of field and sharp detail necessary to illustrate both the field marks and the delicate beauty of the subjects, we often resorted to flash techniques. Close-ups were taken with a ring-light flash calibrated with the magnification as marked on the barrel of the macro lens. Good photographs can be achieved with all kinds of cameras, lenses, and techniques. As with any such hobby, however, the main reward is enjoyment and understanding. With proper documentation, some of those photographs may also reveal new and unusual facts about even our most common butterflies. More and more people are planting their yards and gardens to encourage and attract wildlife, and even a small area can harbor an amazing variety of butterflies. Of the several books on that subject, one of the best for the Houston area is Geyata Ajilvsgi's excellent and beautifully illustrated Butterfly Gardening for the South . To attract the maximum number of butterfly species, both nectar plants and larval food plants must be provided. The two are not the same. Most caterpillars will feed only on a very narrow range of hosts, usually those within a single genus or family. Adult butterflies, on the other hand, visit a wide range of blossoms in search of nectar, although many have their own particular favorites based on flower shape, color, or nectar content. Among the best nectar plants for Southeast Texas are lantanas, butterfly bush (Buddleia), button-bush, milkweeds, pentas, phlox, verbenas, purple coneflower, asters, zinnias, and marigolds. Some are hardy native perennials; others are annuals or more tropical species that must be replanted each year. With an assortment of plants, however, there will be blooms to attract butterflies from early spring until frost. Larval food plants are much more specific, and they are listed in the individual species accounts later in this book. Dill, parsley, and fennel provide food for black swallowtail caterpillars; pipe-vines attract the namesake pipevine swallowtails. Finding these plants as they wander in search of nectar, females lay their eggs and ensure a future crop of butterflies as well. Local dealers can assist with suitable plants for specific soil types and growing conditions, while nature centers and arboretums often have special nativeplant sales and offer advice on the ones most attractive to butterflies and other wildlife. It goes without saying, of course, that chemical pesticides have no place in a butterfly garden; butterflies are insects too. Butterfly populations in North America have undergone profound changes through the years. Some species have virtually disappeared; others have become more abundant across sections of their former range or have expanded into new territories. These trends accompany major land-use changes as forests are cleared and marshes drained. Urban and suburban environments offer a different selection of larval hosts and nectar plants than do native prairies and woodlands. Even the removal of fencerows from agricultural fields and the loss of railroad rights-of-way lead to the loss of butterflies, for these were major corridors of native plants. Pesticide spraying and pollution have had an undeniable effect, again not only on the insects themselves but also on the plants they consume. Butterfly gardening provides one way to counteract some of these losses. Small plots throughout a neighborhood cannot make up for the loss of a virgin prairie or the clear-cutting of a timbered tract, but they may be the last retreat for several species. As with most of our wildlife, the question is not what happened to a declining species; the question is what happened to the habitat. Many conservation organizations have taken an active interest in butterfly preservation, as have the societies of professional and amateur lepidopterists. Individuals and communities across the country must also become involved. It will take a concentrated effort to maintain present population levels, but the rewards are rich indeed.